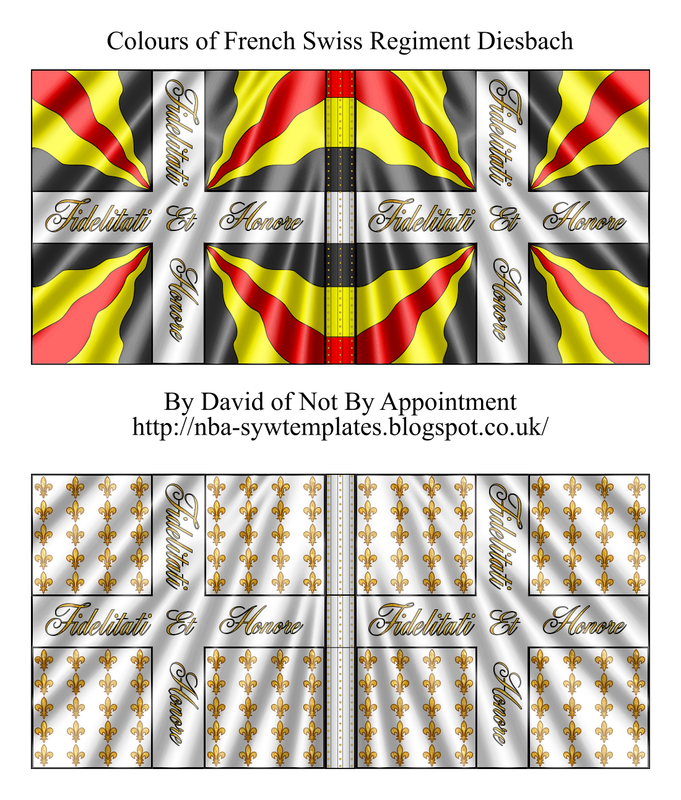 I take graphics commissions, especially for ImagiNations' flags for wargames armies but also for other graphics work - e.g. 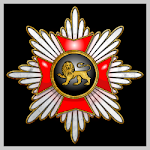 I've also done images of medals for wargamers' blogs and also rank icons for a wargamer's forum. I think my prices are very reasonable (and my customers agree! :-)) so if you have any ideas for a commission you might like me to undertake, please contact me via the contact form below. Please note that, as with all commissioned artwork, under British copyright law (and copyright law almost everywhere in the world) any commission I undertake remains in my copyright unless such copyright is specifically assigned to the client, which usually means a much higher fee. If you need to know more about this, please ask. Xara Web and Graphics Designer - the excellent software used for all the drawings on this blog! 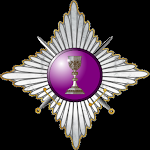 They are two of the first twelve recipients of the Freundschaft Order. For outstanding services to Cavenderia David Linienblatt is the first recipient of the Prinz's Merit Award! 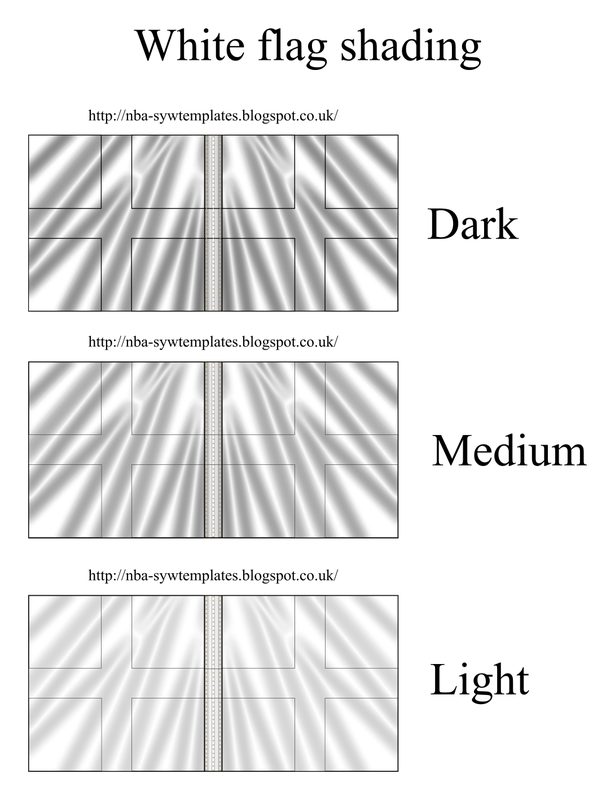 These templates are free for anyone to use or adapt for their own use but no-one must make any money from them or their derivatives, which must also be free. I retain the copyright and also the right to withdraw use of the templates if I feel they are being abused. I ask for an acknowledgement of the author (i.e. me) if you use them; a link to this blog on your blog or website would be appreciated. Left click on the template picture; when the template appears in your browser window, right click on it and "Save As" wherever you wish on your computer. You can then load it into your graphics program to colour it (preferably having saved a back up copy first!). First raised 1713. Stationed in Konigsvörstadt and Spandau, suburbs of Berlin, between 1716 and 1806. Regarded as something of an elite regiment. "Major-General Friedrich Wilhelm Forcade de Blaix was a favourite of the king's and one day Frederick remarked of his troops: "When I want to see real soldiers, I watch for this regiment" (Archenholz). In the army, however, Forcade was known as "that old granny" (dat alte Mütterchen)" (Duffy, Army of Frederick the Great v.2). Two generations of Forcades commanded the regiment; the original Forcade was a Huguenot refugee from France. 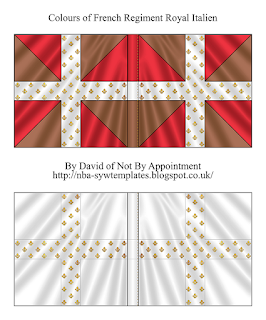 The guard-style flags were given for the regiment's fine performance at Soor in 1745. In the Seven Years War it was distinguished at Prague 1757 (where it lost 22 officers and 602 men); was at Rossbach and Leuthen; and was again distinguished at Zorndorf 1758. During that battle Forcade was badly wounded around 7pm and the regiment lost 400 men. After Zorndorf Frederick said of this regiment and IR 18 Prinz von Preussen "I owe my salvation to these regiments and General Seydlitz. I could do anything with commanders and troops like these" (Duffy, op.cit.). It was also badly mauled at Hochkirch 1758. It was at Liegnitz 1760 and again mauled at Torgau in 1760, losing its commanding officer Colonel von Butzke, 22 officers and 365 men. The uniform in the SYW was blue coat, red cuffs (no lapels), white waistcoat and breeches. I'm still not entirely happy with these but as it's now over a year since I posted anything thought it time to show something to keep things ticking over. No doubt someone will be happy to use them; they are freebies, after all. I haven't time and energy to post regiment and uniform details at the moment; hopefully I'll be able to do that later. I'm sure many of you will recognise them. So I thought I'd better finally get round to finishing and posting them! I hope to do various of the different regimental colour combinations of these flags, which will be fairly easy to do. 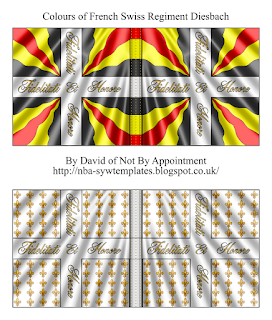 This is yet another "stray" flag set, which I did as a favour and which does not fit into any of my projects. Royal La Marine - originally raised 1669 for fleet service from Compagnies franches de la Marine. Integrated into the French army in 1671. 2 battalions strong. Ranked no.44 in the SYW. In 1756 the regiment took part in the capture of Minorca and spent the rest of the war as garrison there and returned to France in 1763. The uniform was the usual grey/white coat with blue collar and cuffs (with 3 pewter buttons) and blue waistcoat. The horizontal pockets had 3 pewter buttons. The 1757 MS does not appear to have a picture, sadly. 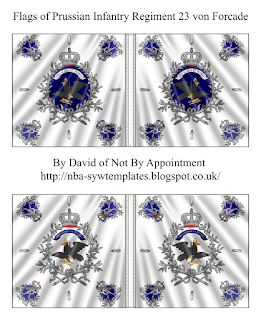 This is a "stray" set of French flags which I did as a favour for Paolo, the chap who runs this Facebook page: https://www.facebook.com/royalitalien/ which has many illustrations and other information on the regiment. I thought I'd post them here anyway, even though they don't belong to any of my flag sets. Royal Italien: Raised in April 1671 in Italy. Only one battalion. During the Seven Years' War the regiment ranked 48th. 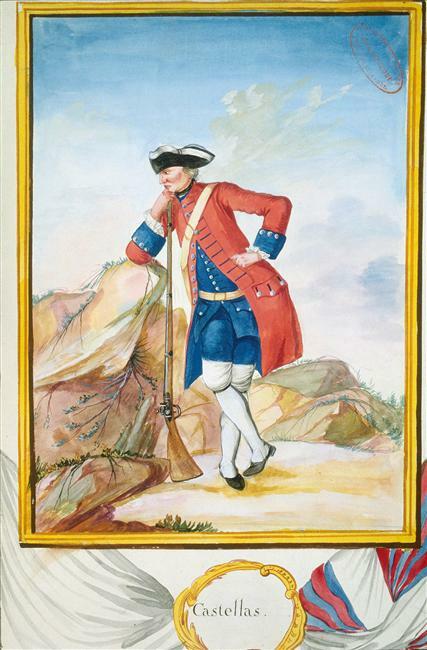 Increased to 2 battalions by the incorporation of the disbanded Royal Corse Infanterie in December 1762. Involved in the conquest of Minorca 1756 and still stationed there in 1757. 1759 transferred to Corsica where it remained until 1762. 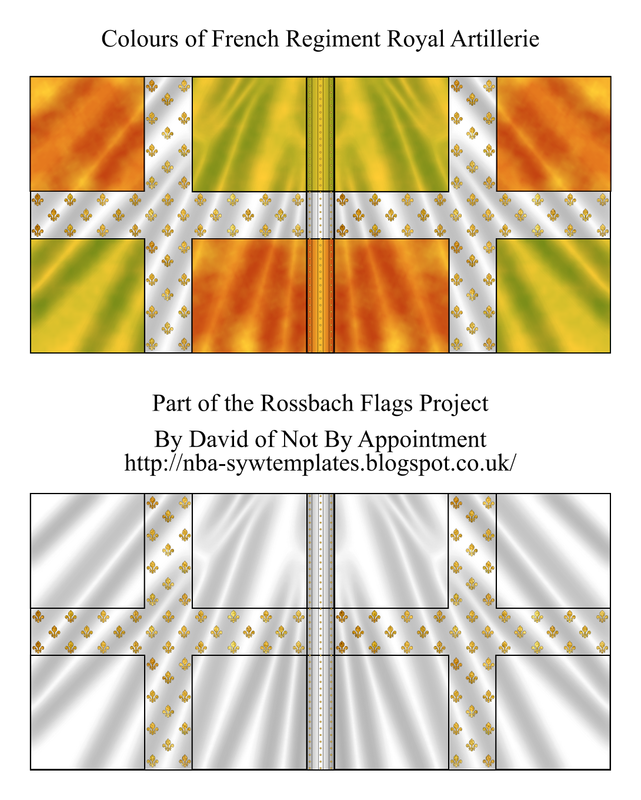 I have been thinking for some time that I might post at least a few Prussian flags, probably of Rossbach regiments to go with the French Rossbach flags. I wonder if there's sufficient interest? I'd like to hear, so please do post your comment. Thanks. Regiment Castellas First raised 1672 as Pfiffer de Wyher and went through various renamings as Colonels changed until it became Castellas in March 1756. It was of two battalions and ranked 52nd in 1757. In the SYW it was part of the Army of Germany and took part in the taking of Wesel, of which it became the garrison. It was at Rossbach where it was brigaded with Salis de Mayenfeld (and where captain of grenadiers Reich and lieutenant Muller were killed, captain Dieffenthaler was wounded and taken prisoner, and "amongst the wounded" were captain Waldner and lieutenant Krefeld. These officer casualties suggest that total casualties for the regiment cannot have been enormously heavy). Having fought at Lutterberg in 1758, it was distinguished at Bergen in 1759 and fought very well at Corbach in July 1760. It was also at Clostercamps in 1760, Langensalza in 1761 and Wilhelmstahl in 1762. (According to Susane, the grenadiers and chasseurs of this regiment distinguished themselves at the action of Neuhaus on the 13th September 1761.) At the end of the war Castellas became the garrison of Belfort. 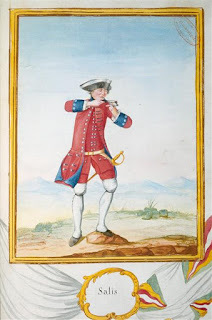 Regiment Salis [De Salis-Mayenfeld] First raised 1st June 1734 from companies recruited in the canton of Grisons, although a company of the Baron de Travers from the regiment d'Affry became its colonel's company. 2 battalions. Ranked 102nd in the Seven Years War. In the SYW it was at Hastenbeck (where Captain Salutz was wounded); Rossbach (where Captain Castelberg and Ensign Schouhe were lost*; these relatively slight officer casualties, especially compared with e.g. Swiss regiments Planta and Diesbach, suggest it was not heavily engaged, even though the regiment was on the right of the mass of French and allied infantry where the second Prussian cavalry charge took place); Krefeld; and Clostercamp. After 1760 it spent the rest of the war guarding the coast of France. First raised 1690. 2 battalions strong. Ranked 90th in the Seven Years War. This was one of the few allied regiments to distinguish itself at Rossbach 5th November 1757, when Frederick of Prussia routed an army of French, Austrian and Reichsarmee troops twice the size of his own with minimal losses to the Prussians. There is a legend attached to their performance on that sorry day for France and the Reichsarmee. It is here recounted by Simon Millar in Osprey Campaign 113 "Rossbach and Leuthen 1757", page 35. "The two Swiss regiments [Diesbach and Planta] were like rocks in the swirling sea of fugitives and Prussians as they steadily carried out a fighting retreat. Frederick is said to have remarked, "What is that red brick wall that my artillery cannot manage to bring down? ", and, being told it was the French Swiss infantry, he silently saluted them by doffing his hat as they marched off the field with colours flying and drums beating." 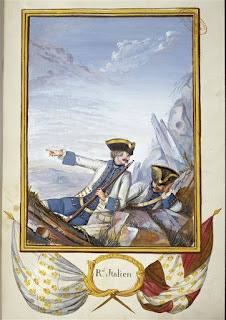 Although he does not repeat the legend in his book "Prussia's Glory" on Rossbach and Leuthen, Christopher Duffy does commend the Swiss for their performance and says that Diesbach not only kept all its own flags but managed to retrieve the abandoned flag of another allied unit which had fled! Susane in his history of the French infantry lists the following officer losses at Rossbach: Captain Garrigue and Lieutenants Borrer, Bury and Alion killed; Captains Balthazard and Rabel and six lieutenants wounded. Such a heavy casualty list among the officers supports the accounts that show them heavily engaged against the Prussians. They performed dependably and often very well for the rest of the war, seeing action at Sandershausen, Lutterberg, Bergen and Wilhelmsthal. Swiss troops served the French for several centuries, by special treaties with the Swiss cantons which were regularly renewed. 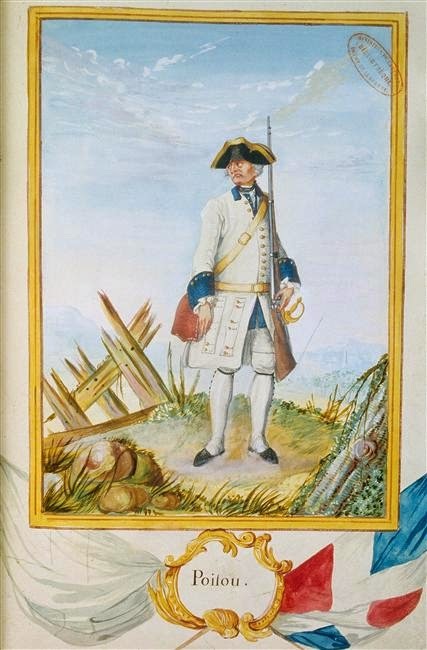 During the Seven Years War there were around 20,000 Swiss serving with the French army. Unlike the native French units they could generally be depended on to be disciplined, sober and disinclined to looting. They wore uniforms of regular French cut but in red (garance for Diesbach). NBA flags in action down in Oz! On the 16th and 17th May Chris Kendrick and others fought a large ImagiNations' battle. 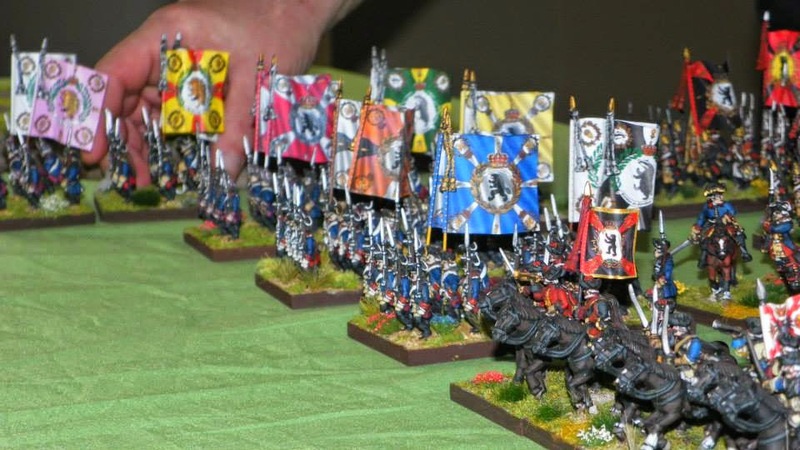 Many of my flags were on display and, if I say so myself, looked pretty good, as did the splendid figures. Raised 1759 as Eliott's Light Horse (or Dragoons), the regiment went to Germany in 1760 and almost immediately made a name for itself at Emsdorf, where it was claimed to have captured 16 colours, six cannon and 2600 Frenchmen. However, the battle was very costly to the regiment and it had to be withdrawn to reform and recoup its losses in Hannover. The resultant fame and publicity led to the raising of several more regiments of light dragoons and, unlike the light troops attached to the heavy dragoon units, most of them were not disbanded in 1763. Uniform: Black enamelled cap, white metal crest and mountings (copper or brass metal sometimes depicted as an alternative), white GR cipher and crown on front, the crown showing red enamel through the gaps, turban dark green, horsehair mane red (although possibly originally designated as white over red), two white tassels at back of helmet. Black stock. Red coat with dark green collar, lapels and cuffs, lined white i.e. white turnbacks. White lace loops and white metal buttons on collar, lapels and sleeves. White tufted epaulette on each shoulder. Waistcoat and breeches white. Boots (of a lighter type than used by the heavy cavalry) black. Dark green saddlecloth with a tan leather seat joining the front and rear parts. Edging lace white with red central stripe. Full colour crown with white GR cipher at front. Rear corner red circle surrounded by wreath of natural coloured roses and thistles with LD in white. White fur cover on holsters. I have sadly been neglecting the blog of late for a variety of reasons - real life does get in the way, doesn't it? 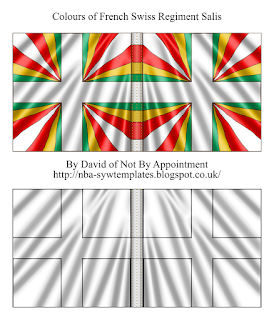 I hope to post a new flag and/or template very shortly. In the meantime, a Happy New Year to all. Garrison Regiment IX was raised in Geldern 1743 as a single battalion and included a grenadier company. It served as the garrison of Geldern until 1756. After the war it returned to Geldern to act as garrison again. When the French invaded in 1757 Wesel was evacuated, leaving Geldern isolated. Although surrounded, the fortress was well protected by flooding and was defended successfully until August 23rd. An attempt by what have been described as "unreliable foreigners" in the regiment to mutiny and surrender the place was foiled (Dorn and Engelmann) but food eventually ran out and Colonel von Salmuth commanding was able to agree terms of surrender with the French which included free departure for the regiment. When they left, most of the men deserted, leaving only fifteen officers, eighteen NCOs, twenty four privates, one drummer and five flags to reach Magdeburg. On October 13th they marched to Berlin, arriving just in time to withdraw to Potsdam in the face of the Austrian general Hadik's attack on Berlin. In spring 1758 the battalion was sent back to Magdeburg to act as garrison. In 1763 at the end of the war it returned to Geldern and combined with Salenmon's Freikorps to make a total of two battalions. The grenadiers of the regiment were combined with the grenadiers of Garrison Regiment XIII and IR45 to form Standing Grenadier Battalion No.II. They had a rough war. Having been part of Frederick's invasion force of Saxony in 1756 which surrounded the Saxons at Pirna, they then took part in the invasion of Bohemia in 1757. They were at Prague in May that year, then the defeat at Moys in September. Having been badly chopped up there they were temporarily amalgamated with Grenadier Battalion 41/44 until the spring of 1758. In November 1757 they were at Breslau as right flank guard. At Leuthen in December they were again part of the refused right flank guard. At Hochkirch in October 1758 the battalion was on the extreme left of the Prussian position and was overwhelmed by the Austrian corps of Arenberg, losing two of its companies as prisoners. After the battle the battalion was once again amalgamated with Grenadier Battalion 41/44. (Duffy shows total losses of over 70% for the battalion at Hochkirch (Duffy, Army of Frederick the Great, 1st Edition).) As the final indignity, the entire battalion was captured at Glatz in July 1760. By then there was no longer any prisoner exchange with the Austrians so the battalion was not re-established before the end of the war. 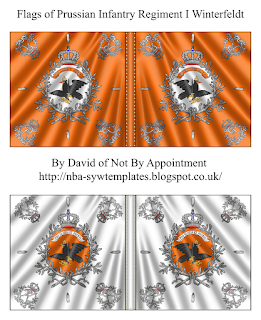 The regimental flag design is shown at the top (Kompaniefahnen), the Colonel's flag (or Leibfahne) at the bottom. Garrison Regiment I was raised in 1718 as a single battalion. In 1744 it was increased to 2 battalions. In 1756 it was again increased, to 4 battalions. The regiment's recruits came from East Prussia, namely the cities of Memel, Wehlau, Tapiau, Hohenstein, Nordenburg, Schirwindt and Stallupönen. In 1756 it was the garrison of Königsberg, Gumbinnen, Memel and Pillau, plus Stettin in 1760. The grenadiers of the regiment were combined with the grenadiers of Garrison Regiment XI during the war up to 1760, forming Standing Grenadier Battalion Nr. IV (G-I/G-XI Lossau). 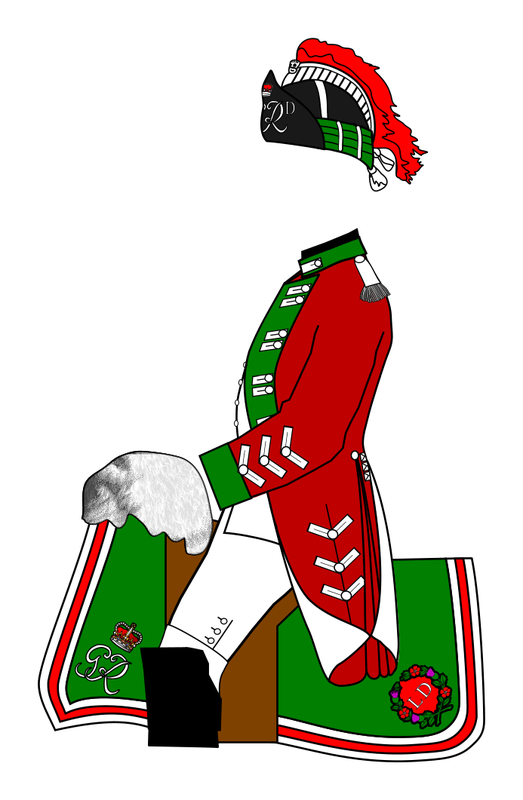 From 1760 they were combined with the grenadiers of Garrison Regiment No.II to form the same standing grenadier battalion. 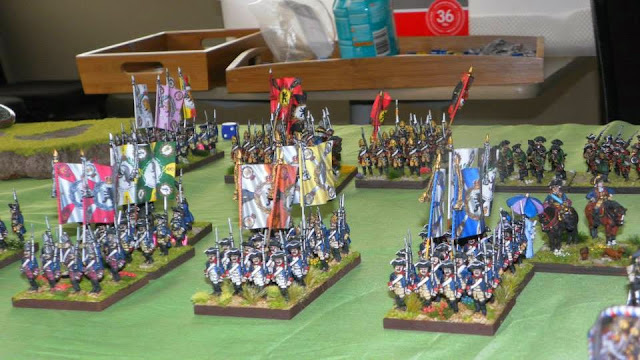 They fought at Gross-Jägersdorf in 1757, Zorndorf in 1758 (around 40% casualties - Duffy, Army of Frederick the Great, 1st edition), Kay and Kunersdorf in 1759 and Torgau in 1760. 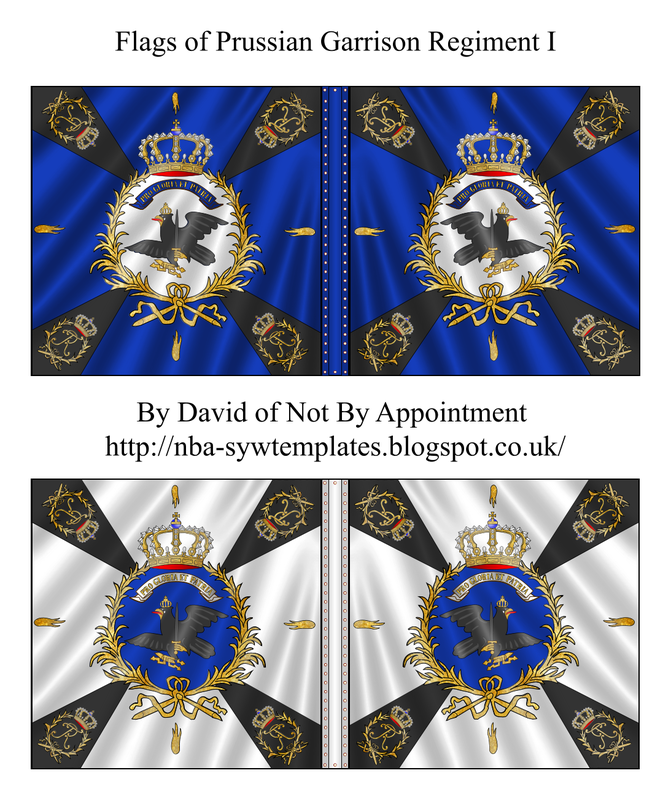 This is the most elaborate style of garrison regiment flag, carried only by regiments 1 and 2. 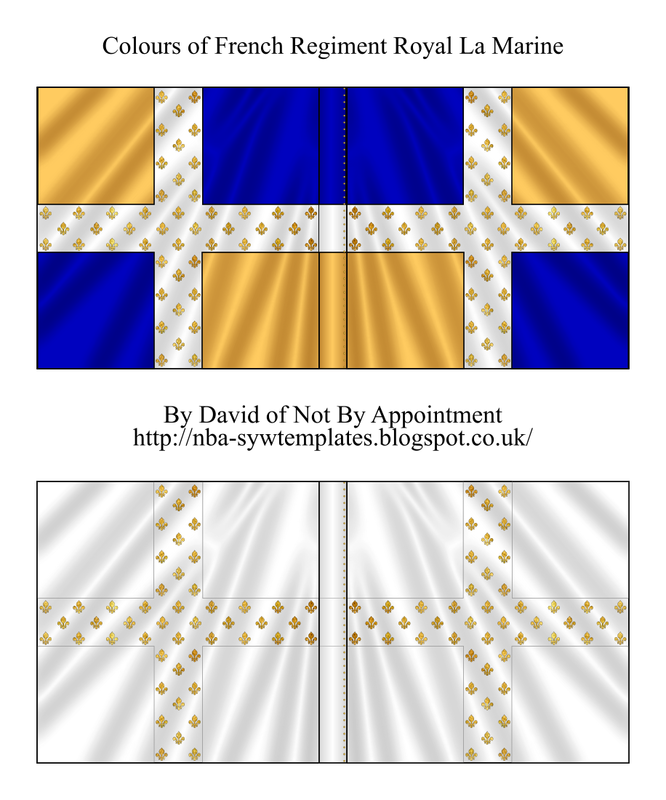 It is very similar to the flags carried by many of the regular line infantry regiments, except for the wreaths which are in the style carried by the other garrison regiments and which are very similar to the design of wreath used on the flags of the regiments of Frederick William I, Frederick's father. 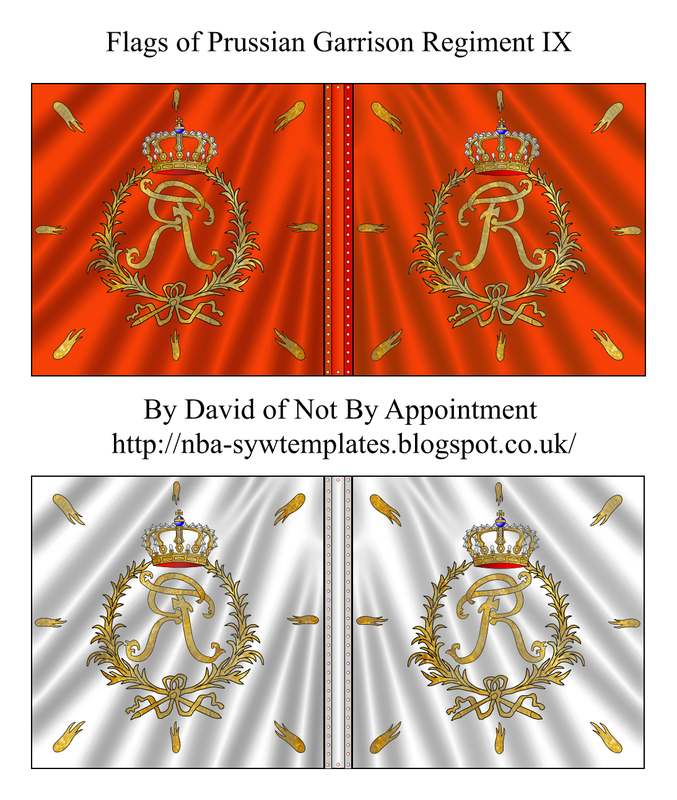 The regimental flag design is shown at the top (Kompaniefahnen), the Colonel's flag (or Leibfahne) at the bottom. 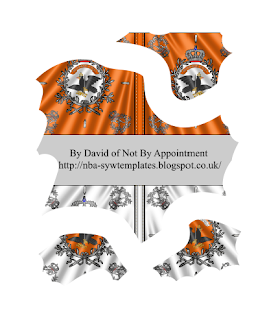 I have now added uniform plates to all three of the Prussian garrison regiment posts. 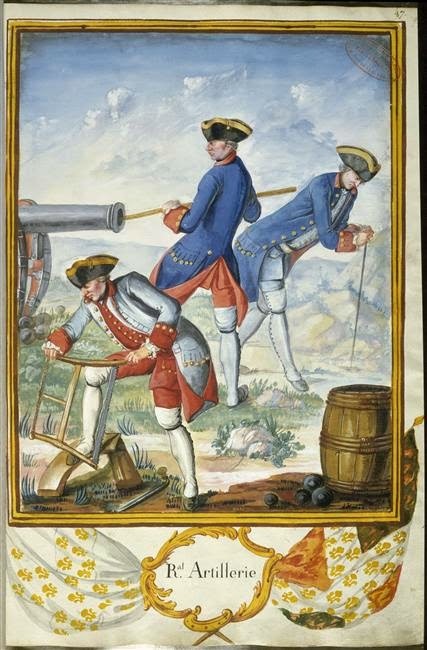 The uniforms of the garrison regiments were generally much simpler and plainer than those of the line regiments, largely for reasons of economy. The Prussian state always struggled to support what was, compared to its population, a very large standing army. In wartime, looting occupied countries, as the Prussians ransacked Saxony in the Seven Years War, often brought in much needed revenue to keep the Prussian war machine functioning. Garrison Regiment II was raised in 1717 as a single battalion and had the reputation of being the best garrison regiment in the army. In 1744 it was increased to 2 battalions. In July 1756 it was again increased to 4 battalions, partly through transfers from Infantry Regiments 11 and 16, and partly through transfers from Dragoon Regiments 6, 7 and 8. (How those dragoons must have hated the drop in status!) The regiment's recruits came from East Prussia, namely the cities of Pillau, Mohrungen, Saalfeld, Lyck, Marienwerder, Rosenberg and Johannisburg. In 1756 it was the garrison of Pillau, Fischhausen and Friedrichsburg. In 1757 the regiment was in the second line at the battle of Gross-Jägersdorf on 30th August and suffered heavy casualties; according to Engelmann, "in the thick Norkitt Forest, amid powder smoke and battle noise, it began to shoot at its own first line by mistake, taking them for the Russians. This confusion made the Russian counterattack possible". It was at Schweidnitz in 1758 and the grenadiers saw action at Zorndorf (over 30% casualties - Duffy), Kay and Kunersdorf (around 30% casualties - Duffy). 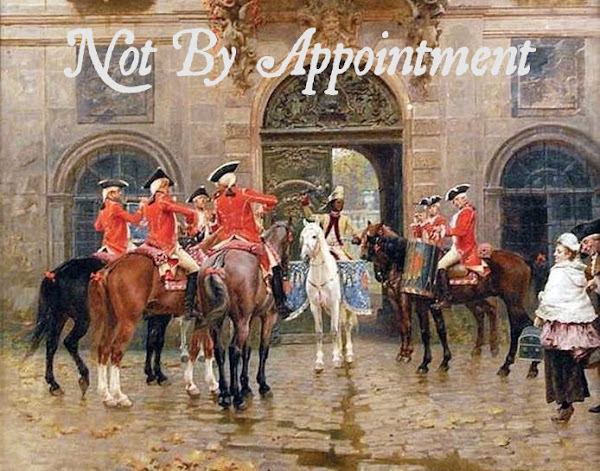 From 1760 the 1st battalion was with Prince Henry in Silesia and Saxony. The other battalions were firstly at Breslau and Neisse, then Neisse, Trachenburg and Militsch in 1762. The 1st battalion and grenadiers fought in the battle of Torgau in 1760, as well as at Freiberg in 1762. The regiment retained 3 battalions at the peace in 1763 unlike the other garrison regiments that returned to their pre-1756 establishment. Garrison Regiment V was raised as a garrison for the newly captured fortress of Glogau in 1741. At first of 2 battalions, it was increased to 4 in 1754. (It is reported that the increase included many men drafted from other Silesian regiments, of normal height "but who are vagabonds and of whom the regiment is not really sure" - Engelmann, Infantry of Frederick the Great.) It was recruited in Glogau until 1747 when its recruiting area was increased to include Breslau and Frankenstein (yes, there really is (or was) a place called Frankenstein!*). The regiment garrisoned not only Glogau but by 1755 Crossen, Reppen, Züllichau, Beeskow and Sommerfeld. It had a very eventful Seven Years War, especially for a unit designated for garrison duties. 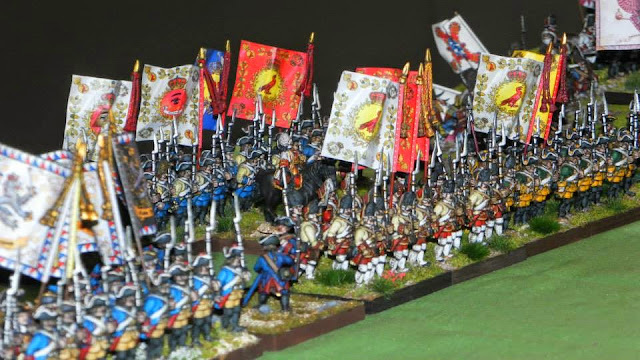 The 1st and 2nd battalions were part of a small Prussian force which was designed to push the Austrians out of Landeshut and were at the first battle of Landeshut in August that year. In November 3 battalions were captured when Schweidnitz fell to the Austrians. In April 1758 the 1st and 2nd battalions were part of the King's army which recaptured Schweidnitz and were subsequently in June part of the guard of the supply train that was destroyed at Domstadl during the invasion of Moravia and unsuccessful siege of Olmütz. The 1st and 2nd battalions were then at the battle of Paltzig (or Kay) in July 1759, where the Prussians were defeated by the Russians, and then had the pleasure of facing the Russians again at Kunersdorf in August, another bloody defeat for the Prussians in the face of a combined Austro-Russian army. 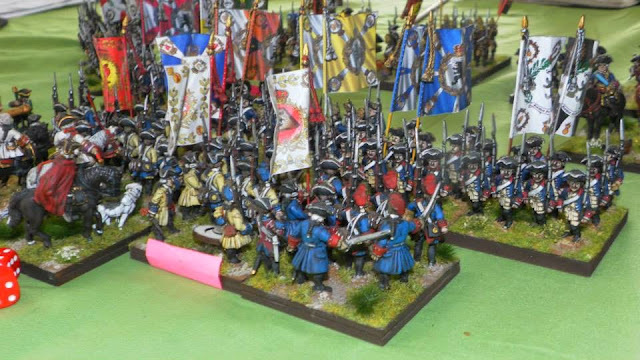 (The 1st edition of Christopher Duffy's Army of Frederick the Great shows that Garrison Regiment V's 2 battalions suffered 20-25% casualties at Kunersdorf, serious losses but probably a good deal fewer than many of the other Prussian regiments involved.) In 1760 they joined Prince Henry's army and stayed on in Saxony. The 3rd and 4th battalions spent most of the war in garrison duties in Silesia, no doubt much to the relief of the troops, especially when they heard of the experiences of the 1st and 2nd battalions! This was the simplest design of garrison regiment flag, carried by the majority of the garrison regiments. 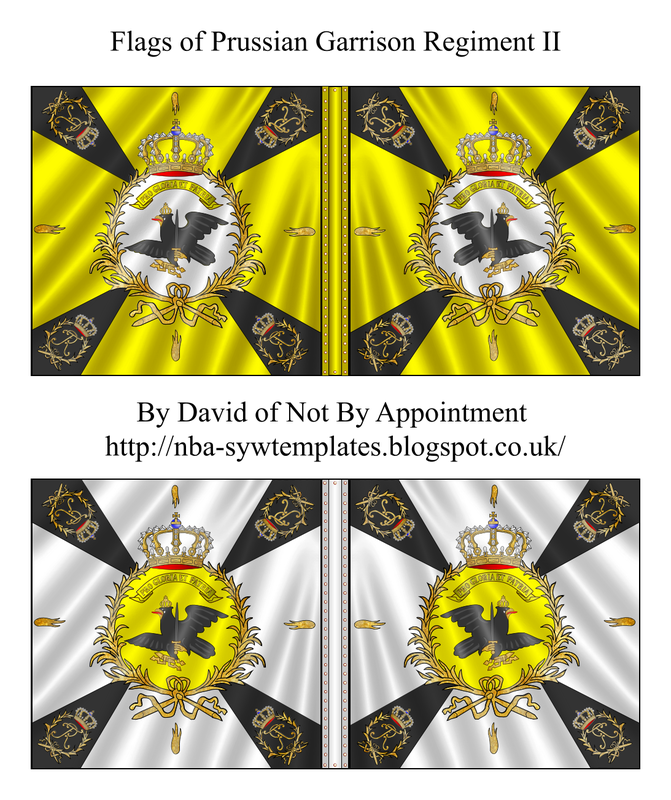 The regimental flag design is shown at the top (Kompaniefahnen), the Colonel's flag (or Leibfahne) at the bottom. 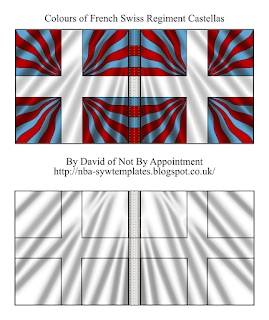 Some years ago I posted simple outline templates of the flags of various Prussian regiments, including some of the Garrison Regiments. I thought I'd update some of them as colour versions and here are the first updated flags. Garrison Regiment III was raised as a single battalion in 1718 for garrison duty. It was recruited in Pomerania - the towns of Colberg, Bublitz, Usedom and Bütow. An additional battalion was raised in 1757, making it a full regiment. At the start of the Seven Years War it was the garrison of Colberg. Its grenadiers (combined with those of Garrison Regiment IV and the New Garrison regiment) fought at Prague, Kolin, Schweidnitz, Leuthen, Hochkirch and Torgau. In 1758 and 1759 the musketeer battalions occupied Torgau and Dresden. In September 1760 the first battalion was taken prisoner in Torgau and the second battalion was taken prisoner in Wittenberg in October that year. 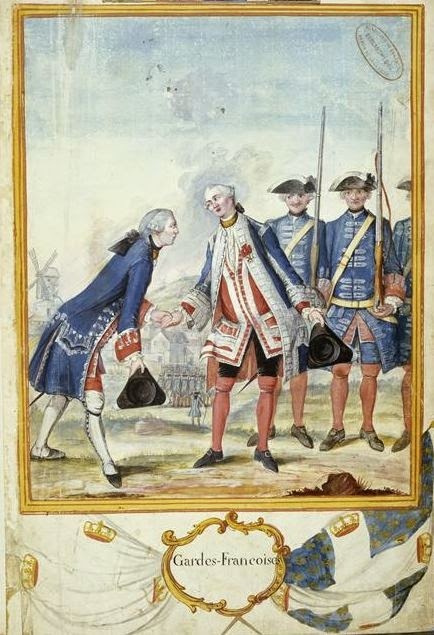 The regiment was reformed at the end of the war in Colberg in 1763, incorporating men from Schony's Frei Korps as well as returning former prisoners. The regimental flag design is shown at the top (these were the Kompaniefahnen), the Colonel's flag (or Leibfahne) at the bottom. 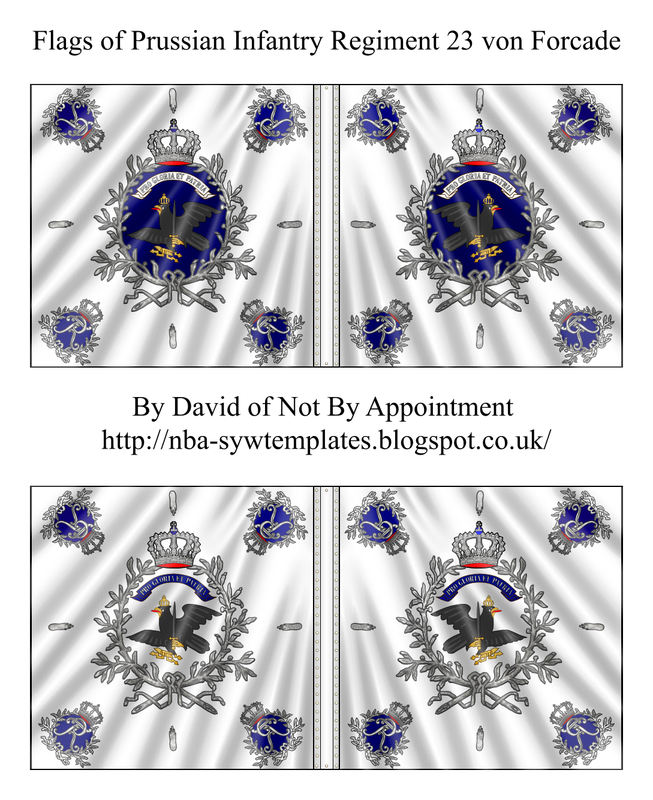 I've added some explanation from Pierre Charrié on the numbers of fleurs de lys in the Gardes Françaises' ordonnance flags to the original posting (see below). I cannot miss commemorating Kolin Day - 18th June 1757, when Frederick suffered his first major defeat at the hands of the Austrians. Hoorah! The blog header image is from the fresco in the Ruhmeshalle of the Heeresgeschichtlichen Museum in Vienna and shows the victorious charge of the Ligne Dragoon Regiment late in the battle. The regiment had many young and inexperienced recruits in its ranks and according to legend had been ridiculed by the army commander Daun himself for its lack of moustaches - he called them blancs becs and so they were itching to prove themselves, as they did magnificently but their casualties were very heavy. After the battle the regiment was given the special distinction of not being required to wear moustaches unlike the other regiments and Maria Theresa also sent four special hand-embroidered standards. 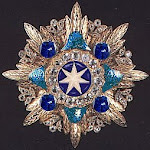 The day of Kolin was chosen as the birthday of the new Military Order of Maria Theresa, an award that retained its lustre as an award of high status which was only sparingly bestowed right up to the end of the Austro-Hungarian Empire in World War One. These are neither Rossbach nor Minden flags but just happen to be French 18th century flags that I like - so here they are! First raised 1563, the Gardes had precedence over all line regiments and the Gardes Suisses. Recruits all had to be native Frenchmen. It consisted of 6 battalions each of around 790 officers and men. The regiment guarded the outside of any palace in which the king was living. Its most famous action was Fontenoy 1745, where reputedly the British were given first shot and 400 of the Garde were lost to the first British volley. Its most infamous action was to be one of the first units to go over to the Revolution in 1789, despite its privileges and status. 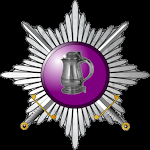 The regiment was disbanded at the end of July 1789. In the SYW the regiment mostly guarded the coasts of France for the first four years of the war. In 1760 four battalions reinforced the army of the Duc de Broglie in Germany. They were at Schaffhausen and Vellinghausen and the siege of Meppen in 1761 but returned to France in October. In 1762 they were back in Germany and were at Grumberg and Johannisberg. 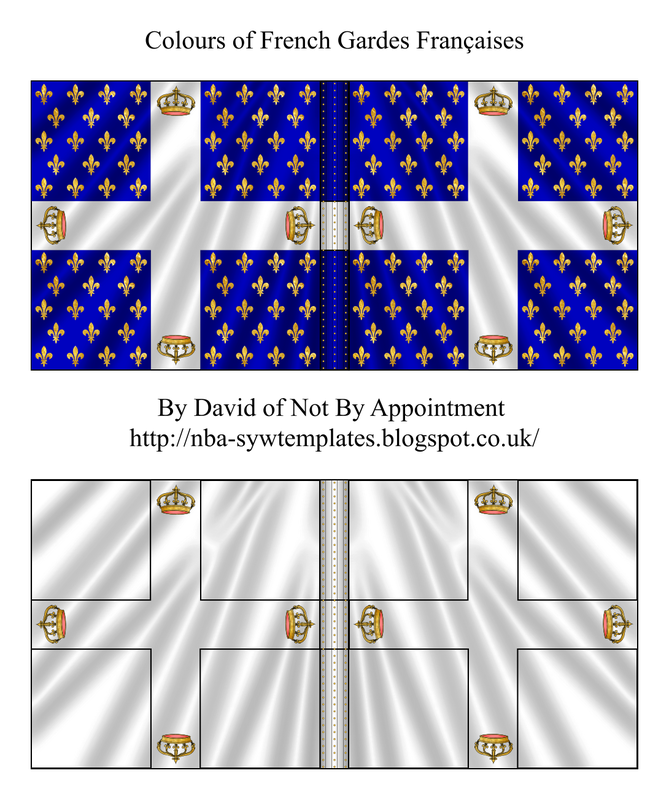 Pierre Charrié (Drapeaux et Étendards du Roi) says that by the late 1760s there were 18 fleurs de lys in each quarter of the ordonnance flag and that at the beginning of the 18th century there were 41 fleurs de lys in each quarter. Interestingly, he shows an illustration of an event at the start of the reign of Louis XV in 1715 which seems to be contemporary and shows the ordonnance flag of the Gardes Françaises with what appear to be only 18 fleurs de lys in each quarter even at that early date. A sixth battalion was added in January 1757 and throughout the Seven Years War "the arm was repeatedly reorganised" (Kronoskaf - see previous link). Naturally every army the French deployed throughout the war used guns and gunners, and often pioneers and miners too. 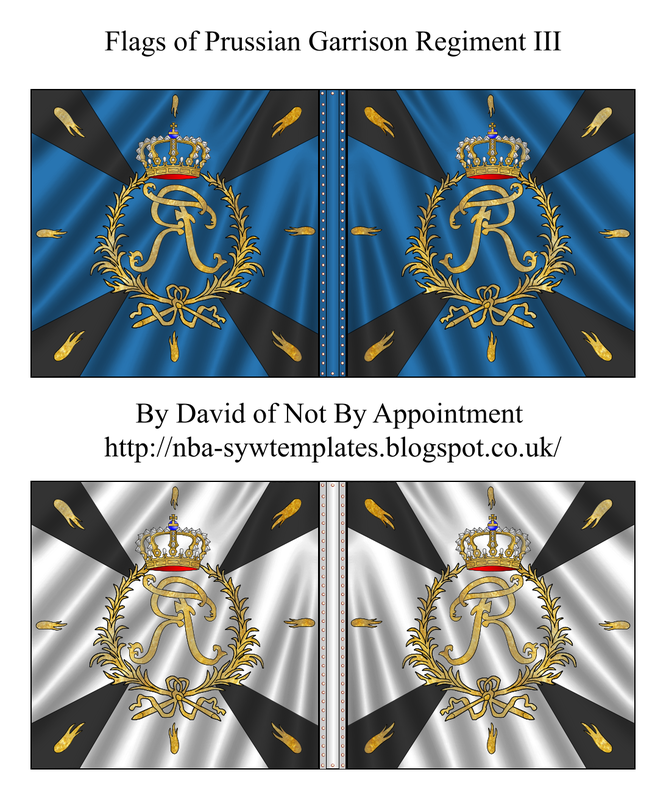 I'd like to thank Jean-Louis Vial, Christian Rogge and Stefan Schulz for helpful discussion on and useful suggestions about how to depict the Ordonnance flag of this regiment. 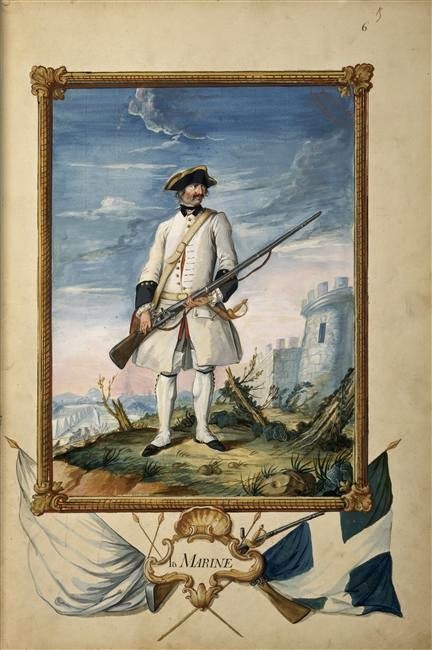 First raised as a regular French unit in 1635, La Marine had 4 battalions. 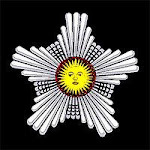 Cardinal Mazarin raised the original unit and was able to have it made one of the Vieux Corps, so from ranking 16th the regiment became the 6th. It was at Hastenbeck in July 1757 and then Rossbach in November, where it covered the retreat of the Allied army, having not been engaged in the battle itself. It had a busy time in minor and not so minor operations until the battle of Krefeld, June 23rd 1758, where it was distinguished defending the woods along the Niers River before retiring in the face of much superior forces. At Lutterberg in October 1758 the regiment was barely engaged in the fighting. In April 1759 it returned to France to help protect Le Havre against a threatened British attack. For most of the rest of the war it was stationed in various French garrisons, apart from a detachment that embarked on an expedition to capture St John's in Newfoundland in May 1762. Although the French force captured the place it was forced to surrender to a British relief force in September and all the French troops became POWs. The flags as depicted were carried by this regiment from 1636 to 1791. 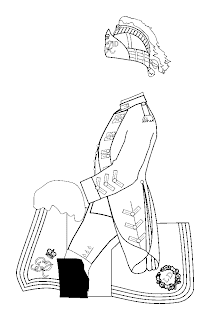 The flags as depicted were carried by this regiment from 1682 to 1791. Well, here we are in a grey and dismal January - and I've had plenty of time to consider where to go with the grey shading on the flags. I've decided on a classic compromise (which used to be a British tradition). I'll tone down the grey, probably to somewhere between medium and light. I'll need to experiment. And as FB said, people can always print the flags out lighter anyway. 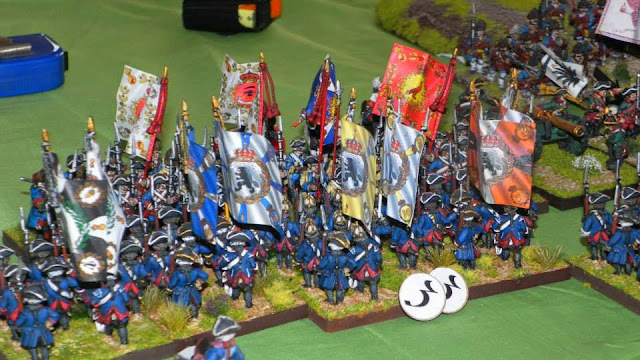 Der Alte Fritz has posted a comment on my latest flags, those of the French regiment Provence, asking me to tone down the grey shading as he thinks it too strong and that there should be "a more subtle transition from the basic white color". 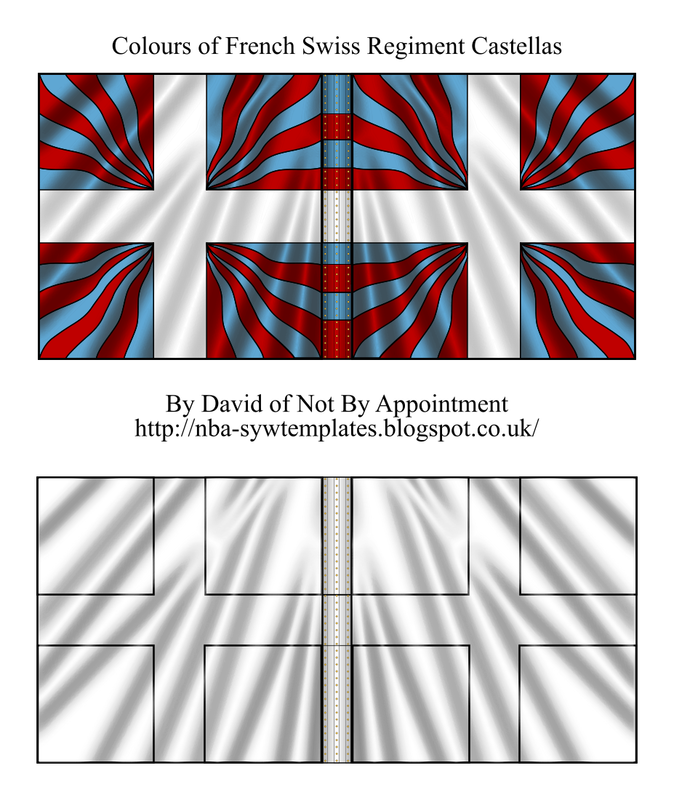 I'd be interested to know what others think on this as I've been trying various strengths of grey shading on the white areas of the flags and on the completely white flags, as some people may have noticed. So, I'd like to know what people think; do lighter greys work better than dark on these white wargames flags? 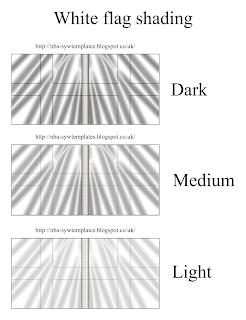 I've posted an image here showing 3 different levels of shades of grey on a white French flag to give an idea of possible variations and to help people see those variations in contrast to each other.